Ullr is supported in the archaeological record by the Thorsburg chape, and through Lilla Ullevi. He is attested in the Poetic Edda, the Prose Edda, Skaldic poetry, and the Gesta Danorum. Lilla Ullevi (“Little Shrine of Ullr”) is an actual preserved shrine that was unearthed just north of Stockholm. The shrine was in a remarkable state, with beautifully preserved wooden and stone structures, as well as 65 oath rings strewn about the area. Very little is actually said about Ullr in the Eddas. The Poetic Edda mentions Ullr’s hall, Ýdalir (“Yew Dales”) and makes a couple of references to obscure ceremonies involving the god. One reference is to “Ullr’s ring” which is thought to coincide with the rings found at Lilla Ullevi. Snorri’s Prose Edda lists Ullr as the son of Sif, and Thor as his step-father, but remains frustratingly silent on the matter of Ullr’s actual father. Saxo Grammaticus, in a surprising turn-about, remains very close to the Ullr descriptions elsewhere, though of course he couldn’t resist plumping up the drama. His euhemerized Ullr, in the Gesta Danorum, sails across water and through the skies on a rib bone. He also rules in Óðin’s place for ten years before being run out of town as an usurper. Ullr is often mistakenly married off to Skaði, though there are no attestations of this, and many attestations of Skaði’s enduring marriage to Njörðr. More likely, since they are both associated with Winter, they would be hunting companions and sporting competitors. Ullr is also mistakenly made a son of Óðin, Njörðr, Thor, or even Freyr and Freya. One interesting theory of Ullr’s parentage, proposed by Viktor Rydberg (Teutonic Mythology) is that Ullr is the son of Sif and Egill-Örvandill, half-brother of Svipdagr-Óðr, nephew of Völundr and a cousin of Skaði. In this scenario, his father Egill-Örvandill was the greatest archer in all the realms, and Ullr follows in his father’s footsteps. Ullr is a very ancient god who is known to us today as one of the men behind the mask of the Celtic deity dubbed “Cernunnos” or “The Horned God.” Many deities are horned gods, which is more of a title rather than a name. Images of gods with antlers, horned helmets, or carrying antlers have been found all over northern Europe, representing Óðin, Freyr, and Ullr. Not to be confused with the modern image of the Viking horned helmet, images of these gods may have contributed to the misconception, but are a completely different thing altogether. Images of the Horned God that can be found in ancient bronze age art work, such as the Gundestrup cauldron, depict him as a mature, virile man, with a full beard holding a torc or an oath ring: an emblem of divine authority. It is common to refer to all such gods as Cernunnos, and it is probable that whether you were of Celtic, Gaulish, Germanic or Norse culture, different tribes called upon the Divine Hunter for similar needs and worshiped him with similar awe and appreciation. Modern Heathens tend to depict Ullr with predatory, rather than prey animals, artistically portraying the God of the hunt with the wolf rather than deer. Somewhere along the contemporary timeline, he has developed a distinctive wolf-skin outfit. Ullr’s name means “Glory” and he is the god of hunting, archery, and survival, as well as single combat and duels. Ullr ranges through his forested realm whenever he’s not watching the High Seat for Óðin. Ýdalir, “Yew Dales,” is his hall. He is the patron god of archery, and protector of hunters and rangers through the wilderness. Among his attributes, Ullr is described as being especially attractive. Ullr is a rotating ruler deity; a chieftain who takes turns. He rules over the Æsir whenever Óðin goes wandering, and he ruled the Vanir during the early wars with the Æsir. It was said that his oath ring would shrink to sever a limb or finger if you went back on your oath to him! 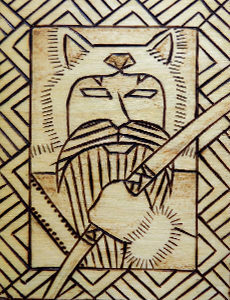 It is possible that he is the Saami interpretation of Óðin. Like Óðin, Ullr is a leader of the Wild Hunt. As such, his holy days include the traditional commencement of the Wild Hunt: the date of the first frost – sometime between October and November in the Northern Hemisphere, marked in modern times with Halloween. Bows (especially yew) and arrows, arrow heads, axes and hatchets, yew trees, and all ever-greens. Oath rings and torcs. Skis (both water and snow) and snowshoes, shields, and rib bones. Skates, snowboards and skateboards. Winter, snow and ice. The Northern Lights. Campfires, the great outdoors, and all rugged men. Animal pelts, especially wolves. Dark green colours, and sometimes red and white as well. Venison, and all game meat. The runes Úr and Eoh. Uller, Ull, Ullur, Wulþuz, Wuldor, Ollerus, Holler, Herne, Tapio, Father Wuldor, Jack Frost.